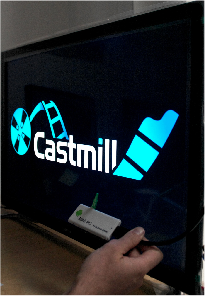 OptimalBits has released their HTML5 digital signage software player, Castmill, for the Android Platform. This version of the player enables any Android device such as phones, tablets or HDMI dongles to be used as powerful and inexpensive cloud based digital signage players. The Android HDMI dongles can be bought for less than $50 and are able to convert a standard TV into a complete HTML5 digital signage solution. “This release is aimed to customers that already have screens or plan to buy screens that lack features for providing outstanding digital signage. With the Android player, any screen can be used for displaying videos, real time information or advertisements. It also enables smaller tablets to be used as cheap signage devices”, said Manuel Astudillo, CEO of OptimalBits. The Android player can be downloaded from castmill.com and is free to use.